It was a day of applause and deep respect and admiration, as the state of Washington awarded the Medal of Merit to two game-changing citizens and the Medal of Valor to Snohomish County communities and tribe who responded heroically to the Oso landslide tragedy one year ago. 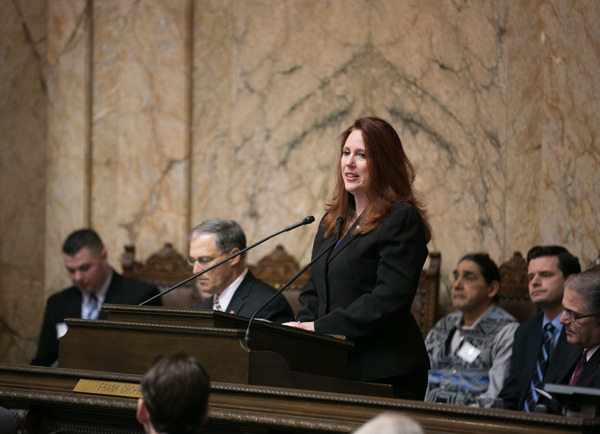 The televised hour-long ceremony Wednesday was held before a joint session of the Legislature. Gov. Jay Inslee, Lt. Gov. Brad Owen, Secretary of State Kim Wyman and Chief Justice Barbara Madsen took part. • Gretchen Schodde, a resident of Union, Mason County, received the award in honor of her work as founder of Harmony Hill Retreat Center in Union, which focuses on wellness and renewal for individuals and families affected by a cancer diagnosis, with no cost for care to participants. Schodde’s pioneering work in a support response to cancer diagnoses is a national model. Schodde has been a health care professional, emergency first responder, educator and volunteer for nearly 50 years. • Billy Frank Jr., a longtime Olympia area resident who died last May at the age of 83, was honored posthumously for his tireless work as a Nisqually tribal leader and dedication to the plight of Northwest salmon, the environment and peace between diverse cultures. Frank played a key role in the fight for treaty fishing rights, and chaired the Northwest Indian Fisheries Commission. He traveled the globe to help indigenous people in saving their own cultures and environment. Frank was nominated for the Nobel Peace Prize in 2010. Frank’s two sons, Willie and Tobin Frank, accepted the medal on his behalf. The Medal of Merit was created by the Legislature in 1986 and was first awarded in 1987. Schodde and Frank are the 31st and 32nd Washingtonians to receive the prestigious honor. The Medal of Valor was presented to the communities of Oso, Darrington, Arlington and the Sauk-Suiattle Indian Tribe for their recovery and relief efforts following the devastating landslide between Oso and Darrington last March. The devastating slide, the deadliest in U.S. history, killed 43 people and destroyed about 40 homes. 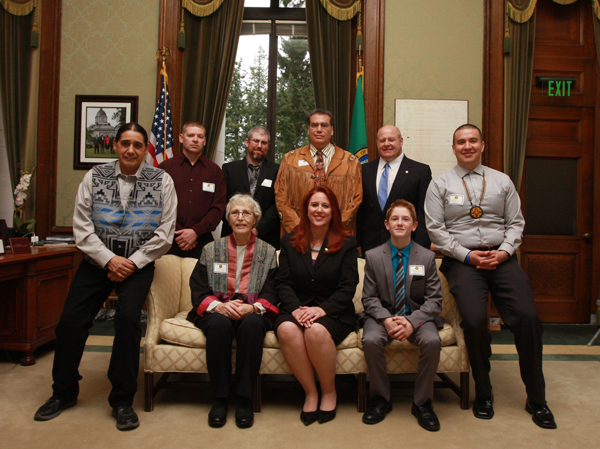 Madsen introduced each recipient as Inslee awarded the Medal of Valor to representatives from Oso (Willy Harper), Darrington (Quinn Nations), Arlington (Brantly Stupey) and the Sauk-Suiattle Indian Tribe (Kevin Lenon). The Medal of Valor recognizes individuals or communities risking their lives or personal safety to save, or attempt to save, another person’s life. The Medal of Valor cannot be awarded to police officers or fire fighters, or others whose actions are a result of their public duties as a first responder. After the ceremony, recipients of the two awards, their families and friends attended a reception at the Governor’s Mansion, hosted by Inslee and first lady Trudi Inslee.